Costello, Matthew J. 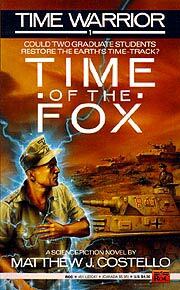 Time of the Fox . Penguin/Roc 1990. Summary: A graduate student becomes embroiled in US-Soviet timeline conflict. Series note: Series containing Time of the Fox , Hour of the Scorpion , and Day of the Snake . Summary: A mental time traveler studying what made the Beatles so great is sidetracked into "change war" action involving Rommel's Afrika Korps. Series note: First volume of Time Warrior. Summary: Our hero becomes a US infantry lieutenant as the time war shifts focus to the Tet offensive and the attack on the US embassy in Saigon. Series note: Second volume of Time Warrior. Summary: More timewar action, involving Pearl Harbor. Series note: Third volume of Time Warrior.